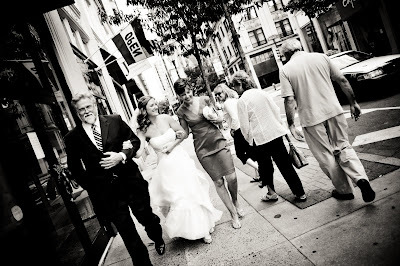 Instead of riding in a limo from the hotel to the wedding site (it was only three blocks), I decided that I wanted my parents to walk with me. This was a really hard decision for me to make. Was it rude to ask my bridesmaids to hang out at the hotel for an hour while we had our first look and took photos around the city? 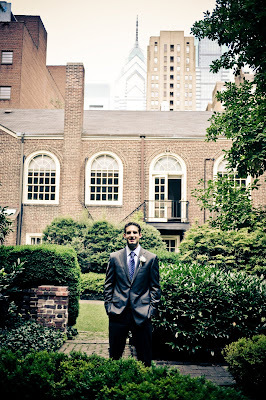 Was it weird to walk the streets of Philadelphia in a wedding dress while this lady took pictures of me? Perhaps, but do you think I noticed? All these random people congratulating me, my beautiful mom and handsome dad on my arms, I wouldn't have done it any other way! 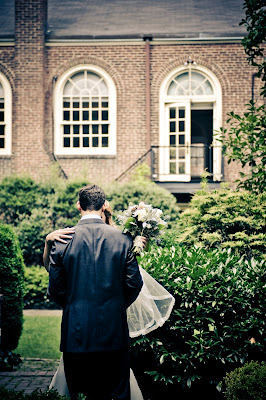 The plan was that Jon would be waiting in the garden for me, sweating profusely and getting really nervous. Too bad he doesn't sweat or get nervous. Note the skyline in the background.